Established in 2001, ICP DAS USA is a manufacturer of cutting edge industrial automation and control hardware and software. It offers a broad range of flexible and cost-effective total solutions for various industries, including energy and power, factory and machine, agriculture, aerospace, oil and gas, etc. Its products range from M2M and "Internet of Things" (IoT) controllers and protocol converters to remote data acquisition I/O modules that support a variety of communication protocols including Modbus RTU, Modbus TCP, CAN bus, Profibus, Profinet, Ethernet/IP, HART, EtherCAT, DeviceNet, BACnet, and Wi-Fi. Why Choose ICP DAS USA? Offering phenomenal OEM flexibility, ICP DAS USA is the ideal partner for your next one-off or OEM specific application! With low lead times, cost effective design solutions, and personalized care, ICP DAS USA offers comprehensive, custom solutions suitable for any scale client! For more than a decade, the company has been firmly dedicated to developing cutting edge Industrial, Data Acquisition Systems and Intelligent Communication products that enable integrators, OEMs and industrial users to implement completely reliable, cost-effective, and flexible embedded control and data acquisition systems. ICP DAS is headquartered in Taiwan and has built a reputation as a worldwide supplier of high quality, Industrial Data Acquisition and Control Products. From Serial Communication and Automation Products, to PLC Hardware and Industrial Ethernet, ICP DAS has been an industry innovator in the Industrial Data Acquisition and Embedded Control fields since 1993. Our products are manufactured in Taiwan. On June 2001, ICP DAS strengthened its position as a global supplier of Industrial Data Acquisition and Embedded control products by launching USA operations. 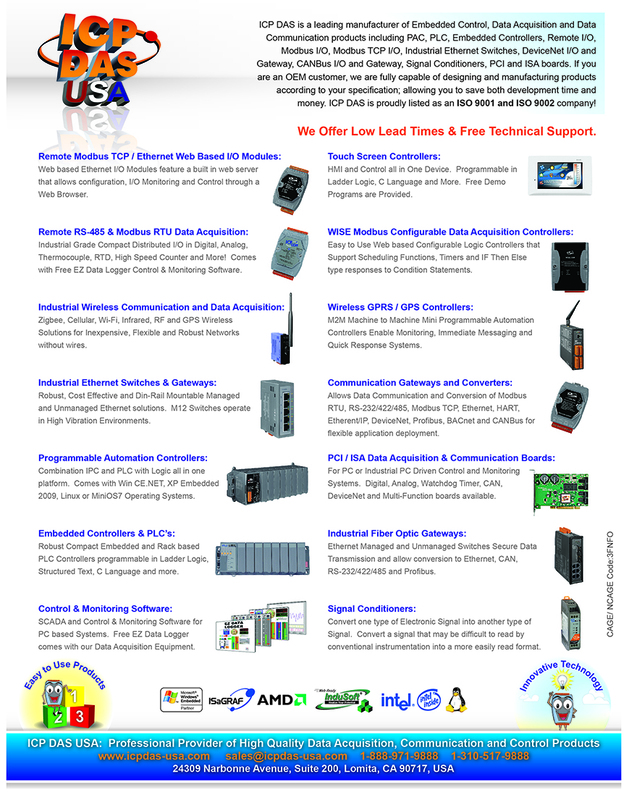 ICP DAS USA located in Los Angeles, California will sell and support all ICP DAS industrial control products and data acquisition systems for the North and South American Markets. We are proud to have a long satisfied customer list in US including: Applied Material, Anderover Controls, Argonne National Lab., Boeing, Brooks Automation, Cognex, Dow Chemical, General Dynamics, Naval Air Warfare, Northrop, Raytheon, TAC America, TRW, US Navy, Yale University, and many others. Since its inception, ICP DAS has continuously set the pace with industry achievements that included the "Dual Watchdog" monitoring both the I/O module and host controller and the "Self Tuner" an innovative chip designed for auto-tuning of baud rate and data format. Over a decade of field experience in Data Acquisition & Embedded Control development has resulted in I-8000, the company's newest innovation. This advanced embedded modular Ethernet based system virtually eliminates production losses that can occur due to control system failures. It also provides a connectivity to any level of the enterprise information system and significantly lowers total development and ownership costs. Click here to see our ICP DAS USA Powerpoint Presentation. ICP DAS USA is always looking for new and exciting OEM and ODM opportunities! If you feel that you may have a project requiring special needs, ICP DAS has a wealth of experience as an OEM manufacturing solution provider!